On Oct. 4, 1986, Mexican singer/songwriter Juan Gabriel ranked at No. 1 on Billboard's newly created Latin Songs chart with "Yo No Se Que Me Paso." It was a time when Latin music and Latin culture overall in the United States were still oddities, flanked on the East Coast by the predominantly Cuban Miami and on the West Coast by predominantly Mexican California and Texas. Although there were occasional flare-ups of Latin beats, Latin music was niche. A quarter-century and 324 No. 1 songs later, we find a very different chart, one populated by a mix of traditional Mexican music, homegrown urban and pop tracks and some English-language hits, reflecting an increasingly diverse audience that includes younger, U.S.-born Latinos that are now tuning into what used to be only their parents' radio stations.To celebrate 25 years of inspired music on Latin Songs, have a look at the 25 top artists in the chart's history. 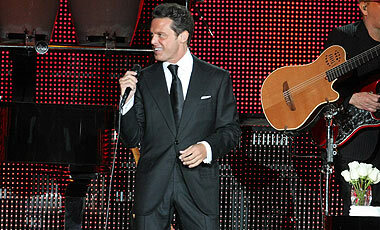 With a grand total of 57 chart hits and 39 songs in the top 10 over the course of 23 years, Luis Miguel is the No. 1 Latin Songs artist of the past twenty-five years. Altogether, his songs spent 843 weeks on the Latin Songs chart. Miguel's hits have included pop tunes, Mexican mariachi classics, and Christmas songs; but most importantly, he gave a new voice to the bolero, singlehandedly reviving the classic Latin love ballad for a multigenerational audience. "Luis Miguel put in the mouths of his generation all of the great romantic songs that had a thirty year history," said Armando Manzanero, composer of many of the great Latin love songs of all time and producer of three of Miguel's "Romance" albums. The 25th anniversary Latin Songs artists ranking is based on actual performance on the weekly Latin Songs chart dating to its inception in the Oct. 4, 1986, issue through Sept. 24, 2011. Rankings are based on an inverse point system, with weeks at No. 1 earning the greatest value and weeks at the lower end of the chart earning the least. Due to various changes in chart rules, chart length and methodology throughout the years - including the implementation in 1994 of monitored airplay data from Nielsen BDS - songs had varying reigns at No. 1 and on the chart. To ensure equitable representation of the biggest hits from all 25 years, time frames were each weighted to account for the difference between turnover rates from those periods.